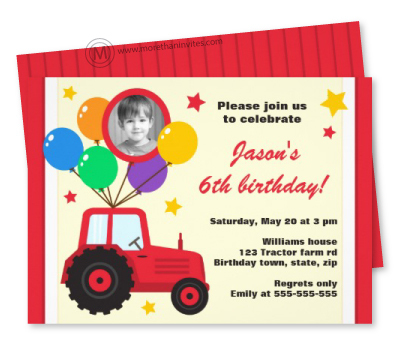 Fun birthday party invitation for kids with farm / tractor theme. The invite features a red cartoon tractor with colorful balloons and custom photo on one of the balloons. Customizable red and black invite text. On the back is an illustration of a red barn wall. Perfect for farm themed birthdays.